The audio system is unable to accurately reproduce the entire frequency range with a single speaker. For reproduction of low frequencies required a speaker with a large cone area – subwoofer. In addition, the subwoofer also required for installed multimedia systems. The subwoofer is designed to reproduce frequencies up to 100 Hz but the main frequency 60-85 Hz. Since this device requires a bulk acoustic design, it is easiest subwoofer to place in the trunk. Installing the subwooferand the front panel is very complicated and rarely used. All known subwoofers can be divided into 3 groups: low-frequency dynamics, active and passive subwoofers. Active subwoofer the most easy to install and consists of a subwoofer and amplifier. It is inexpensive, is small in size and all installation problems are the arrangement and connection of necessary cables. Passive subwoofer on the composition different from the active no built-in amplifier. A separate amplifier must be chosen. Bass speakers are different from the passive subwoofers lack of body, which must be made independently. The most common speaker size 8, 10, 12 and 15 inches. Made with their own hands the body of the subwooferand will have individual, original and compact. Most common are housing the subwooferand closed and bass reflex. A sealed box is easy to manufacture and very forgiving of installer. You have to make it airtight, durable, paying attention to the pairing with surface dynamics. If done correctly, the diffuser needs to resist the push and slow to return to its original state. If the housing of the subwooferand to use the entire volume of the trunk of a sedan, you need to completely isolate the trunk from the cabin and to install a special acoustic shelf. The bass reflex is a port of a certain area and length inside the housing of the subwoofer. A vented box will sound develops more pressure than the standard case. The difficulty lies in the proper combination of box volume, length and cross section of the port. Error even in one parameter will ruin the work of the subwoofer. Regardless of the method of installation of the subwooferand it should be as isolated from the rear speakers installed in the rear shelf. 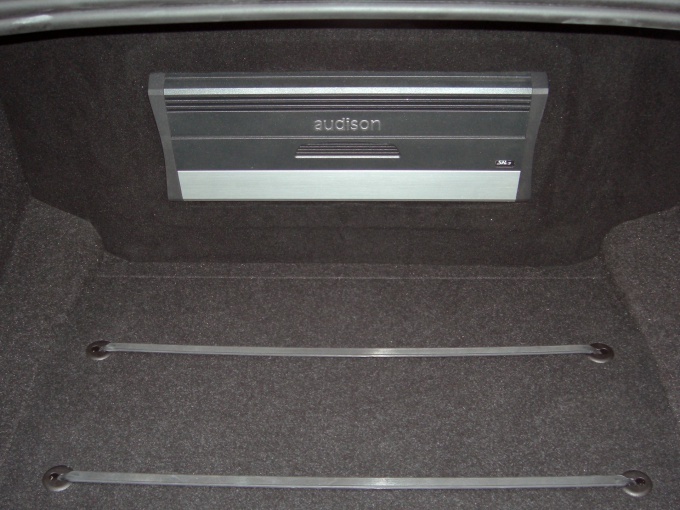 The subwoofer can be installed in the trunk of a car. This is the simplest method, which is easy to assemble by yourself the required enclosure subwoofer. For a concealed installation of a subwooferand use a full or partial installation in the corner of the trunk, close to the wing. Even more secretly install a subwoofer you can, hiding it under the inner wall of the trunk. Another option: install a subwooferand floor. Either raised floor or uses a volume inside the spare wheel. All the subwooferyou have the left and right input, and to connect, you need a long and thick speaker cable. This device can be connected to the outputs on the amplifier and speaker system to be high-level outputs on the subwoofer. E. thereby the load on the entire sound system will be distributed evenly, and smoothly increase. You can connect the subwoofer to the same outputs and the speaker system. To select the best option install the subwoofer in the chosen location, plug in and listen to music with bass.